WITH a set list of today's hottest songs, but not necessarily those in the Top 40, Hunter covers band SLINK has clued onto the fact today's music lover is growing choosier. Performing on Friday, June 11, at the Duck's Nuts Hotel, Slink performs material by artists such as GRINSPOON, SPIDERBAIT, PEARL JAM and REGURGITATOR as well as classic rock. They're the kind of songs you might hear played on TRIPLE J, traditionally the radio station more discerning listeners turn to hear what new Australian bands are playing. But just because Slink plays covers don't think they aren't turning heads in the music industry. During a recent gig at a Singleton venue singer/songwriter DAVE WILKINS from UTOPIAN BABIES spotted the group playing and asked the group to do some support slots. Lead singer CATHY STUDDERT is keen to track Wilkins down and lock some dates in with the group which is signed to ROADSHOW, the same label as SAVAGE GARDEN. Studdert said the group's repertoire was about 75% current material, which was updated 'by two or three songs every fortnight or so'. 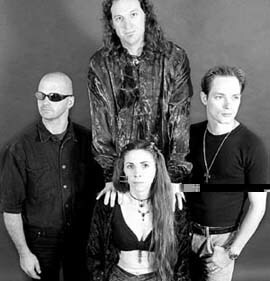 Bass player SHANE CROOKS (ex-SOLDIER BLUE) guitarist CHRIS BAILEY (ex-BARON), and husband drummer ROD STUDDERT back Cathy on lead vocals and percussion. As well as quirky one-hit-wonders from the 1980s the group performs classic rock from the 1970s to the 1990s by BLONDIE, CHEAP TRICK, DOOBIE BROTHERS, FLEETWOOD MAC and SANTANA.